If you like Groot and trees then maybe you want to check out this great looking Guardians of the Galaxy Groot journal. 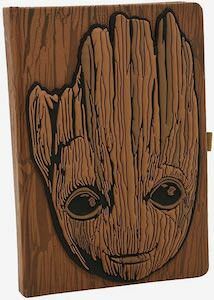 This notebook looks like it is made from wood just like Groot and on the front you will find the face of Groot and that looks pretty amazing. Inside the Guardians of the Galaxy notebook you will find lined pages and on the bottom of each page you will be finding the face of Groot so that you know this Marvel superhero is with your what ever you will be writing down. The Groot notebook has a pen holder on the side and inside it there is bookmark too so that you know where you are. If you need your phone and tablet charge where ever you are then you just have to check out this Guardians of the Galaxy Groot USB car charger. 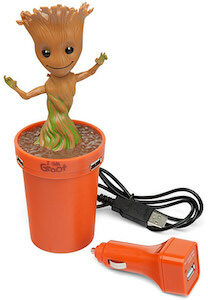 The car charger is a plant pot with baby Groot in it and you can plug him into the car and then you have two USB ports ready to charge your phone and other USB devices and the plant pot will fit great in a cup holder of your car. And we all like how little Groot dances and he does so to while being charging your devices. Besides in the car you can use this Groot USB charger at home to as it will look cool next to your computer. If you like a fun shirt for Christmas then you should check out this I’m Christmas Groot t-shirt. The t-shirt is available in black and navy blue and in style for men and women in sizes Small – 6XL and you can get it as a Christmas sweater too. 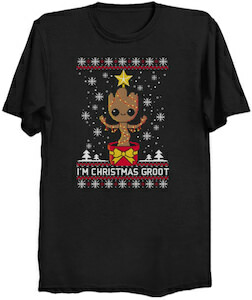 The shirt shows Groot in a pot and he has a star on his head and lights on his arms and he is surrounded by snowflakes and under him it says “I’m Christmas Groot”. It’s a great fun holiday t-shirt for fans of Guardians of the Galaxy and it just look so fun and festive. Now there are Groot slippers and that makes you a true Guardians of the Galaxy fan with warm feet. These women’s slippers come in a wide range of sizes and would look great on men too. 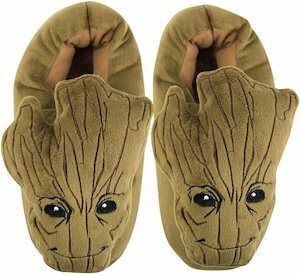 The slippers look like the head of Groot and so now you can lounge around the house wearing this Marvel superhero on your feet. Just imagine how cool these Guardians of the Galaxy slippers would look on your feet, just pick the right size and you are ready to enjoy warm feet and the company of Groot. Now there is a ceramic mug with a dancing Groot on it. If you like Guardians of the Galaxy then this is the mug for you. 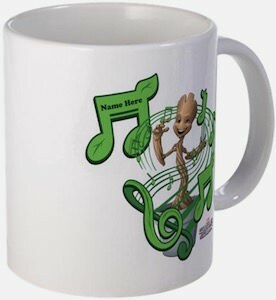 The white ceramic mug shows Groot in a pot growing and dancing and on the biggest musical note it can have your name. A personalized Guardians of the Galaxy mug is great fun for yourself or as a gift. And with your name on it this Marvel mug is great for work as nobody will use it as your name is one it. Start the day with a Groot mug as he is dancing and that will make you smile early in the morning. Now you can take a nap and feel protected by one of the strangest creatures on the universe Groot. This fleece blanket shows the Guardians of the Galaxy star standing straight and above him it says “I Am Groot” and that just seems one of the few things he likes to say. 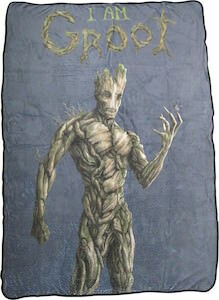 This Groot throw blanket is 45 x 60 inch and is made from 100% polyester as fleece is made from from that. Now you can just have this blanket ready for a cold night in front of the TV or just for keeping you warm while reading that amazing Marvel comic. Mr. Potato Head toys are good for hours of fun and now there is a new potato head on the black in the form of Groot from Guardians of the Galaxy. The Groot Poptaters parts are great for mixing and matching with other Mr. Potato Head toys so that you can build like a hybrid superhero. 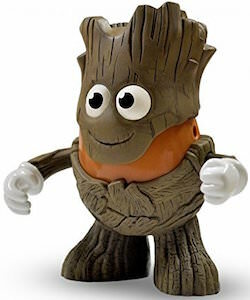 The Potato Head of Groot is 6 inch tall and looks of course a lot like a tree. The big happy eyes and the big smile really will make you love this Marvel superhero. Besides lots of fun for kids the Groot figure is also highly collectible. Remember dancing baby Groot in the movie Guardians of the Galaxy? Now you can have your own little Groot and he will even dance for you. Just turn it on and the Jackson 5 will start playing and Groot will start doing his dancing. 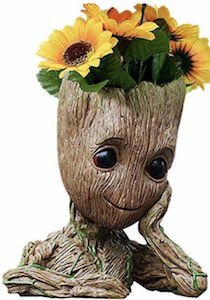 This replica of Groot comes in a white flower pot and just makes for a great collectible that will look great on a shelve where it can dance all day. Now every Marvel fan can have their own tree that does not need any water just some power and Groot will dance. Come take a closer look at this Guardians of the Galaxy Dancing Groot Figurine. As if Groot from the awesome movie Guardians of the Galaxy wasn’t cool enough, now you will be saying “I Am LEGO Groot”. 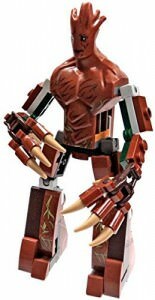 This action figure features all of the attributes that you find in Groot done with everyones favorite building blocks LEGO, still looking like the tree like superhero with the stump torso and head, long claw and root like hands all standing up and ready to guard. The Groot LEGO action figure has classic LEGO pieces making it easy to mix and match with other LEGO superheroes or pieces, this is a great gift for the Guardians of the Galaxy fan. Reenact your favorite scenes with this Guardians Of The Galaxy Groot Lego Action Figure.